In late winter and early spring the greens in my garden are running riot. One way that I love to use these up is to make an asian style noodle soup with lots of greens. It takes about 10 minutes to make and I think it is delicious. 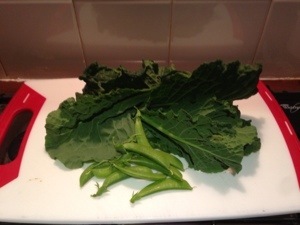 Tonight I used some leaves from a savoy cabbage that is starting to bolt, kale or silver beet would be great too. I’m also eating my way through a glut of sugarsnap peas so I threw some of these in. I also used some broccoli. This asian style noodle soup is very flexible. Use whatever noodles, greens or flavours you have. I think it is slightly different every time I make it. This is tonight’s version. Here’s a very vague recipe. Cook the noodles in the stock with the ginger and garlic. The time will vary depending on whether the noodles are dry or already cooked. This usually takes around 5 minutes for dry rice noodles. When the noodles are done add the greens and cook until they are bright green and just done, around 2-3 minutes. Add the seasonings to taste. You can use as much or as little of these you like. Taste and adjust. You can make this soup in a single large bowl in the microwave, but if you don't have one or don't like them you can use a large saucepan. Sounds delicious. 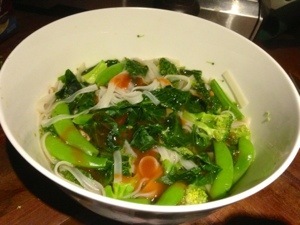 I love slurpy noodle soups, particularly when they swim with good greens and chilli.